The plan for the day was to put on some miles searching out new water for crappie. Lots of miles and lots of crappie actually. At 5 am, the truck was packed and we were rolling. Blue skies and warm temps were in the forecast to make fishing today a delight! The fish pounded from before sunrise till about 7:15. Mainly, the bite was composed of pie plate bluegill which is nothing to complain about! 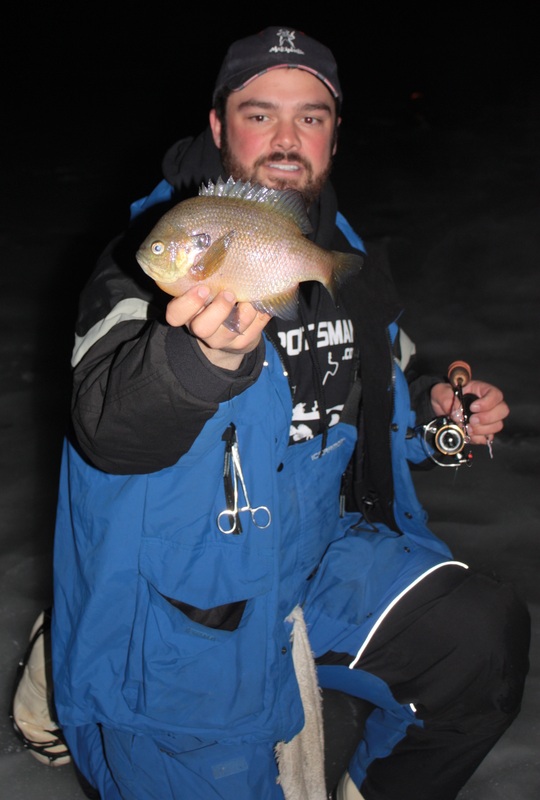 In a little over three hours, I caught 18 crappie amongst a bunch of bluegill and perch. The bite was happening but not as quickly as we had hoped. With other spots in mind we packed up and headed out. The next spot we worked ended up being the final spot of the day. After about 20 minutes of catching nothing but chip bluegill and pumpkinseed, we hit the mother load. We were looking in deep water for fish that weren’t there. With a set of holes running shallow into 6 feet we found them up on the shelf stacked thick. 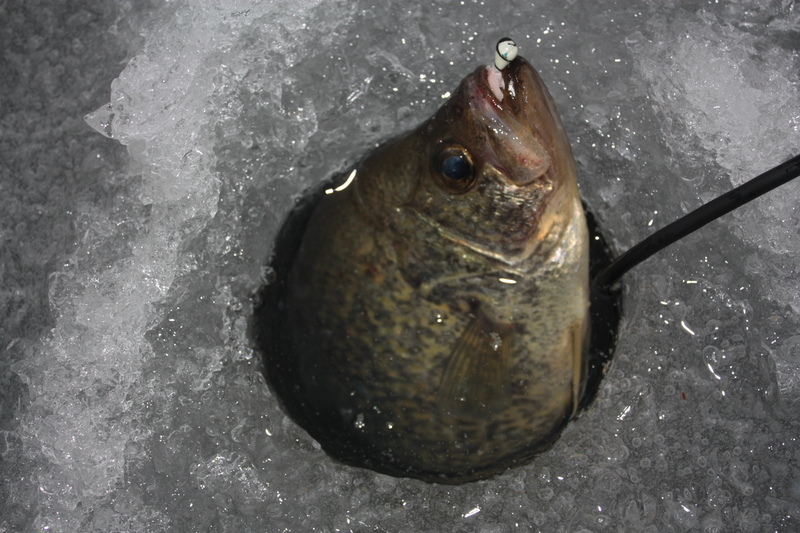 A normal hole would produce 10-15 crappie before having to move. Luckily, we were fishing old tip up holes so we didn’t have to punch many risking scattering the fish that were there. After catching fish out of most of the holes that were already there we decided to punch in the appropriate more making more water available to fishing. The holes all seemed to hold fish and in most cases the initial drop produced the most aggressive and largest crappie in the area below. The water on this day was very clear. If I had used my shack I think sight fishing would have been very effective. As soon as I would set the hook, the fish was revealed as its dark back gave way to its bright golden side. Most days and tips we would give would tell you when using a flasher to never drop your bait right to the fish. You want to stop a foot or two above and make the fish come to you. The fish on this trip wanted nothing to do with that. Using a Vexilar, each hole was easily determined on whether it was worth fishing or not. Looking for fish stacked up on the bottom, I would drop down as soon as they appeared. Rather than the typical jigging action above the fish, I would drop right down into the pod of fish and quickly work my bait back up above them. Very few instances I would not have a follower. Although the fish needed a different jigging method than usual, I ended up landing 148 crappie. 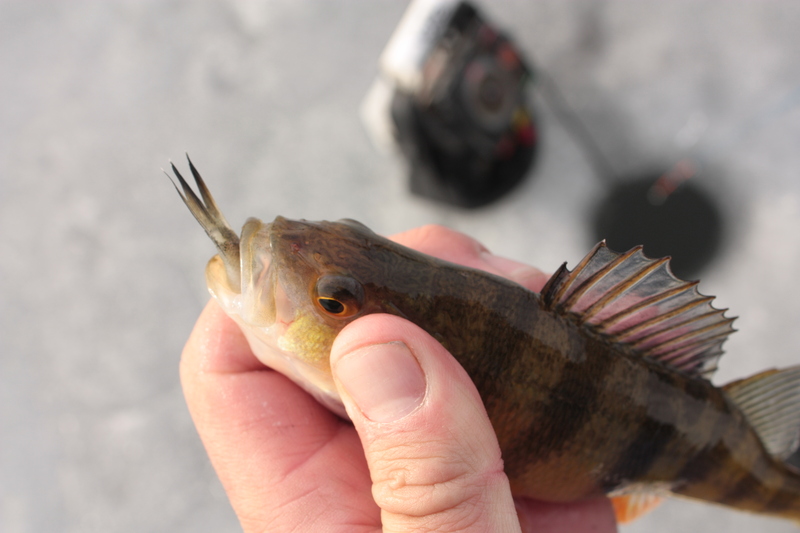 When the fish were below a hole it was not uncommon to catch them by the dozen! 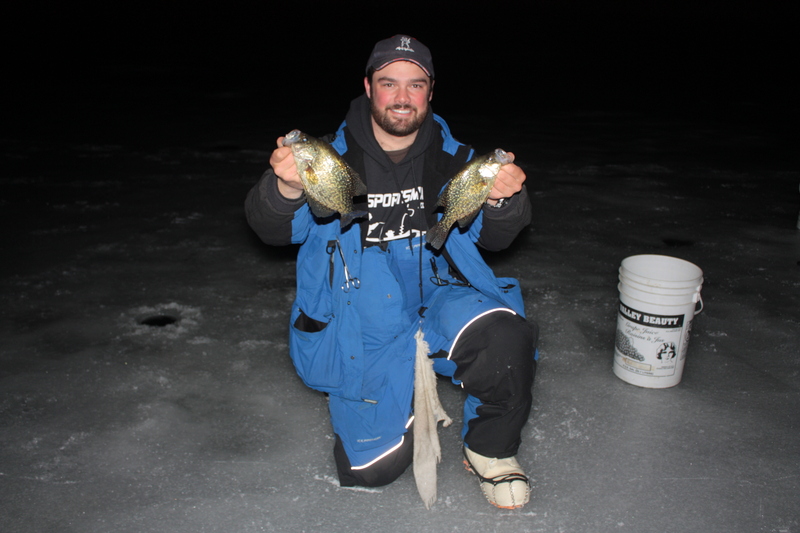 Check out Mostly Crappie On The Ice Today on our YouTube page! Love your reports! Makes me want to get after the crappies every time I read one. I haven’t had a day like that in ages! It’s interesting how you changed up the technique and got the bites – I use that technique on one certain lake when the crappie are slow, it always seems to work there. I’m jealous about how much you guys are getting out, I’ve only had enough safe ice to get out 3 times. Love the reports! Thanks for reading. Fishing sure has been good to us! Now there’s a perch who has eyes bigger than his stomach!